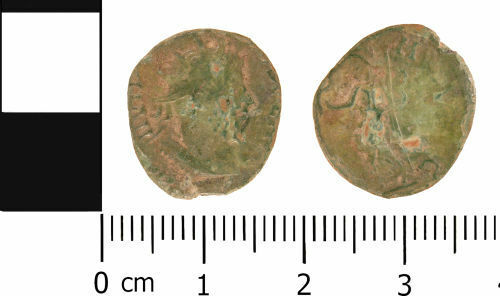 An incomplete copper alloy radiate, probably of Victorinus (AD 269 to AD 271), probably dating to the period AD 269 to AD 271 (Reece Period 13). Probably SALVS AVG reverse type depicting Salus holding vertical sceptre and feeding snake with left hand. Mint uncertain.